Width x Length: 20" x 20" x 2.5"
The best fiberglass paint arrestor available, providing unmatched service life, paint holding capacity and efficiency resulting in low in-use cost. Incorporates progressive density construction from front to back to decrease face loading and increase holding capacity, lengthening the interval between changes. Bright yellow, highly visible color provides added spray booth illumination while maintaining optimal airflow. 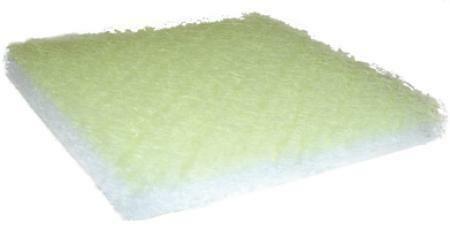 99.4% efficiency rating and available in pads or rolls! Complies with the EPA’s new regulation, 40 CFR Part 63 - See Test Result. If cost is of utmost importance, please consider our Regular Density fiberglass paint arrestors.